An enormous versatility is signalized by the season autumn/winter 2008-09 : there is Neo Classic beside Romanticism, Bohemian and Hippie, Couture and Layer Look, Neo Sportswear beside High Tech Glam. One common thing can be seen as binding element: high quality and refinement in material and production and an affection for details. Thus, in spite of all the multitude, there is one topic pooling the looks of the coming autumn/winter season: STRONG ATTITUDE. The key looks of the season are: chic and cool – simple and sophisticated – glamorous and sensuous – feminine and masculine – sportive and elegant. The play with volume is being continued: narrow silhouettes in combination with voluminous coats or box-shaped jackets, and the volumes can be seen in a controlled way like for example a high waist-line in particular accentuation. Clear cuts in combination with discreet details bring about an elegant look with a neo-couture touch. Brilliance and metallic effects provide technical qualities and an adequate portion of sportivity that is often used as contrast in combination with woolly | hairy effects. There is an unequalled variety of shapes: casual knitwear dresses from mini to maxi, narrow cigarette-style pants beside bell bottoms and Marlene pants up to knickerbockers. Designed tulipshaped skirts next to pencil skirts and supple jersey layerings. The colours of the season are of a fascinating variety: reaching from strictly monochrome colour pictures, also in glaring red, grass green or deep blue to more decent and darker colours with fir-green, dark violet as well as nocturnal blue up to clear black| white | grey contrasts. As the Dynamic Vibes also bears other influences from the music culture and the sports fashion there is a congruence with the major trends but also contrasting streams to be considered. Fir-green, violet, candy-pink, clouds-grey, brilliant yellow – all of them also in metallic design combined with matt and warm tones of bark like oak-brown or birch-white. concrete-grey, marble-black, plaster-white accentuated by sulphuryellow, matt violet, YvesKleinBlue. Tradition in new interpretation – style in new definition – rustic style meets city chic – elegance with a touch of irony. Opulent volumes and new lengths for knitwear and shirts in combination with narrow pants or leggings, superwide trousers and maxi skirts with short and strictly-cut jackets, roughly knit jumpers and –jackets as well as capes with narrow cigarette-shaped pants, also in brilliant coating. Blazer and jackets in lumberjack pattern combined with uni-coloured slacks and maxi skirts, knitwear jackets with duffle buttons and narrow suit trousers. New combinations of casual and formal, matt with brilliant, woolly with metallic lustre. Trenchcoat variations with and without belt in new proportions. The key material is knitwear reaching from fine to coarse and often with traditional patterns like braiding or rhombs that are used very intensively. In addition some flat and shiny textiles as well as wool variations from felted to fluffily soft. Large-format shoppers in vertical or horizontal shape. 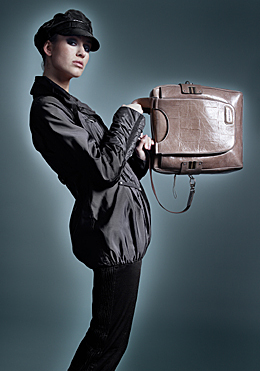 Handbags with short, compact grips, supple shoulder bags in material mix, multi-pocket flap bags with broad shoulder straps. The surfaces appear oily, imprinted or waxed, mostly matt or with embossed structures and partial or extensive braidings. Material contrasts like felt and lacquer, canvas and leather, smooth leather and velours. Braidings for shoulder straps and grips – for the rest decoration is restrictive and discreet. Travelling-bag formats and weekend-bags for urban use.Large-sized hunting- and flap bags in leather-canvas combinations as well as in oiled leather, narrow business briefcases with smooth or imprinted surfaces and ingenious locks in tarnished metal. eccentricity – inviduality as a form of style. Draping clothes also worn over pants, Marlene pants with spencer jackets and long ribbon blouses. Flared pants reaching from slight flares to extreme widths, casual tops with draping elements, also layerings. Blouses in most various lengths – here classic there playful with frills or ribbon collars. Woollen short coats in A-shape beside spencer jackets and masculine jacket types. Lamb velours jackets in a new length. The informal play with various lengths is defining the style for this look – extremely short to extremely long, mini to maxi, layering of different lengths. The influences derive from the 20s and 70s – the new mix creates an artful style- and pattern mixture. Leisurely Gabban shapes in combination with bootcut slacks and shirts with abstractly floral designs, narrow leather jackets in combinations with coarse knitwear and narrow trousers – a perfectly styled nonchalance. Medium-sized to oversized pouches, well with fringes or metal trimming, large-format supple pochettes with uneven surfaces by imprintings or pleats | frills, decorative doctor bags from tiny to medium, also in antique finish and matching metal decorations, patchwork and fur applications, plastic strings as shoulder straps and over-sized locks in metal or plastic stand for modernity. Metal trimmings and rivets of any shape and size look aged, blackened and give the ‘extra something’ of the look. High-size shoppers of washed and matt smooth leather, city-weekend bags also high-size in variable volumes, multipocket shoppers and doctor bags with slight patina and aged metal parts. Common to all the lines starting from „H“ to „O“ up to „X“ are sharp contours for the silhouette. Shoulders are accentuated by mutton sleeves or shoulder lines in the style of the 40s – found with costume jackets, blazers and coats. The pants are straight or slightly flared. The skirts vary from pencil shape to tulip- or balloon shape, the waists are narrow and emphasized by broad belts. The coats are sculptural in woolly materials. The cut designs are ingenious and refer to Couture elements of past years. The materials are flat and firm reaching from matt to brilliant, volume is achieved by plaits and the art of cutting. 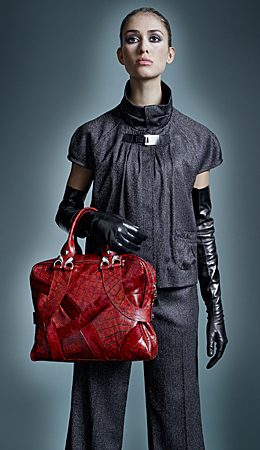 Hats, gloves, and belts bring about the refined design of the looks. Clutch bags in a big variety and all possible shapes: tiny to XXL accompanied by supple, big-format pochettes in softly gleaming leather types, tiny purses on long shoulder straps and strings, and solid, clearly defined balloon-, rectangular- and circle shapes. On top of that: sculptural shoppers. The leather is the crème de la crème: ostrich, snake, croco, and also ray leather. silver emphasizing the sculptural character. Weekend-bags and sports bags formats deLuxe: croco designs beside lacquered surfaces, bowling bags with shoulder straps, narrow business briefcases brightly polished and conference briefcases in most elegant leather. concrete-grey, marble-black, plaster-white accentuated by sulphur yellow, matt violet, YvesKleinBlue. Now as before super-narrow shapes are in the fore – beside the play with controlled volumes: futuristic-looking strait suits and costumes, narrow and wadded nylon jackets in combination with stretch overalls, cigarette-shaped trousers with short, box-shaped jackets. Coats are to be seen with voluminous capes or collars with hidden hoods – the waist is still accentuated. The materials vary from Cool Wool with even and partly brilliant surfaces up to intensively shining techno qualities mostly in quilted design – giving the look a touch of space shuttle traveller. Big and soft pouches conveying the impression as if they were “all of a piece” as contrast to the plain pochettes with tone on tone details; straightlined, futuristic shoulder bags in high size or horizontal format. The focus here is the interaction of material and shape. Hightech materials as well as lacquered or metallized leather surfaces set the tone. Decorative elements, if at all existing, subordinate to the material and barely contrast in colours. Hypermodern „hard shell“ notebook bags as well as messenger bags made of neoprene or ballistic nylon in combination with leather. 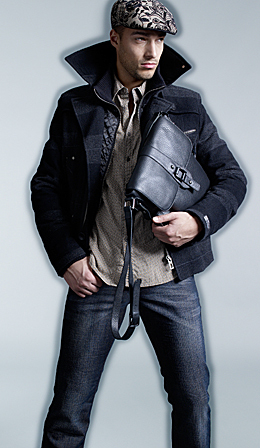 Ultra-shining leather for weekend-bags or men’s city bags in horizontal format with or without shoulder straps. Pixel works – in the true sense: graphic allover prints in digital colour spectrum for Tees, Sweats, jackets and even pants – patterns reaching from micro patterns to maxi patterns causing retinal flickering, in addition allover coloured denims. The tops are voluminous, the trousers narrow to skinny. Hot pants and mini skirts are combined with leggings. DJ bags, nylon shoulder bags, patterned rucksacks. Allover prints on messenger bags, bump bags. Small casket bags at long strings, large-sized shoppers in lacquer design, overdimensional pochettes. Flight attendant- and sports bags in clear and brilliant colours. White as a background for a full, energetic colourfulness of bright yellow, racing-red, grass-green, ultra-violet supplemented with black. suspenders, patterned socks, and ”Creepers”, spencer jackets, blouses with frills and super mini skirts with polka dot leggings and lacquer pumps – the dress codes of ”rock’ a ’billy” and ”Ska” are inspiring examples. Messenger bags, map-cases, purses on long strings, high-size shoulder bags accompanied by flap bags, rivets in all sizes and shapes, mostly in silver on black, motorbike chains and superlong strings as shoulder straps. Aged smooth and grained leather play the lead. Black in all shades, partly complemented by lacquer-red and lacquer-white. Swinging London in the New Look à la ”Pete Doherty” for Boys and Girls: young and narrow suits dressed down by Palestinian neckties, cord jackets combined with vintage denim pants, ”Grandma’s” lace blouse with ice-washed denim and patterned tights. Saharel pants with tight-fitting striped pullovers, wide coarsely knit jumpers with Marlene pants or pencil-shaped skirts. ”Oldschool“ briefcases modernized by shoulder straps, high-size flap bags, patchwork pouches and bags uni-coloured or with contrasting colours, oversized supple pouches as well as pochettes with borrowings of gone times. The materials are soft to variations in velours, also fringes, frills, and fur trimmings occur. Lacquer finish or metallized effects can be seen beside embossings and stitching. A subdued colour story in a slight vintage appearance composed of black, brown from coffee to caramel, with occasional dots of brick-red, verdigris, and copper. The dark side of the 80s – bands like ”Joy Division” and ”Bauhaus” were the inspiration for this story: dark to black nylon jackets in combination with black denim; young, double-buttoned blazers with black shirts and narrow cargo pants, wadded jackets and parkas combined with denim and brightened up by strass elements at Tees and clothes. Multifunctional shoulder bags with a multitude of front pockets, variable sizes with the help of zippers on the sides, high-tech material beside leather and lacquer designs, also in mixture. Metal parts are matching in colours with the materials or are even lacquered tone in tone. Dark colouring with all shades in black, partly freshened up by accents in neon or strass.